Fr. Denk will be working primarily in the Global Learning Center. The students will work with him to continue to develop resources for The Prodigal Father. With his specialization in spirituality and the media, he will be helping our University “Make Christ Known and Loved” through the media. He will also be celebrating the Sacraments Regularly and providing spiritual direction and mentoring to Walsh University students and staff. Fr. Michael J. Denk was recently welcomed as an Aspirant in the Institute of Voluntas Dei. Fr. 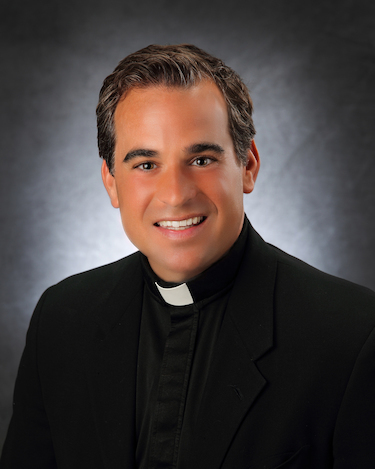 Michael J. Denk was ordained for the diocese of Cleveland on May 12, 2007. Fr. Michael received a Master of Divinity and a Master of Arts from St. Mary Seminary in Wickliffe, OH. His thesis was: Christology in the Mystics: Coming to Know, Love, and Serve Christ through John the Evangelist, Theresa of Avila, and Ignatius of Loyola. He received a Bachelor's Degree in Communications, with a specialization in Video and Audio Production from Cleveland State University in 2001. He is a prolific writer and has been published in numerous periodicals including The Priest, Our Sunday Visitor, Emmaus, Crisis, Homiletics and Pastoral Review, The Word Among Us, and Shalom Tidings. He can be heard regularly on Living Bread Radio on the Series Faith with Father (Covering the YouCat) and daily scripture reflections. He has done interviews with numerous local and Catholic radio stations including The Catholic Guy: Lino Rulli on Serius XM, Living Bread Radio: Faith with Father, and daily reflections. He has appeared on EWTN on Living Right with Dr. Ray as well as the Salt and Light Network as a Witness Interview as well as Advent, Christmas, Lent, Easter Series and Inspirational Videos. He also has his own blog where he publishes his homilies weekly, has a series of interviews about priest’s prayer lives: “Praying with Priests”, and His Monday Night Live Show “The Prodigal Father Live!. Visit TheProdigalFather.org for the free resources and latest updates. His newest Program is “Praying With The Mass” which helps people get more out of the mass by bringing their personal life to mass and experiencing God in a real way at every mass. The series is available for free online. Hard copies of the DVD/CD and Keychain for children are available for donation. Fr. Michael is dedicated to helping others encounter Christ through the celebration of the Eucharist, Preaching, Confession, Spiritual Direction, and Prayer.